Internet DNS servers deliver critical services to your company, such as internet visibility for your customers, partners and employees. 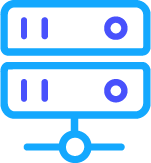 If you need more security and the best performance for your DNS infrastructure, you can choose to deploy a hybrid cloud DNS infrastructure (allowing for central management of your in-house DNS servers and domain name in the cloud). The DNS Cloud solution from EfficientIP is powered by Amazon Route 53, and can help you easily design, deploy and manage a best-in-class DNS architecture.